Hotel Drukchen is a newly built Hotel. 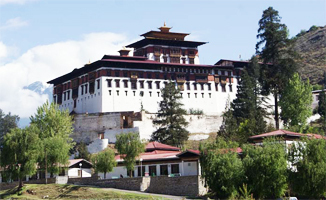 Located in a neighborhood overlooking the Paro Airport, it is approximately 2 km from the town of Paro in the direction of the Tiger's Nest Monastery. 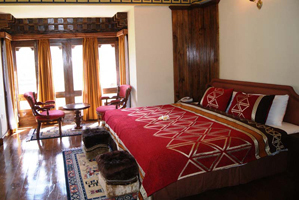 The 23 rooms (19 deluxe and 04 suites) of Drukchen hotel are spacious and well-appointed. The buffet style breakfasts and dinners are of a decent quality. Hotel Facilities: Bar, Conference, Business Center, Currency exchange, Spa & Fitness, Laundry Service. 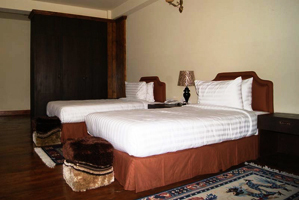 Restaurant: Hotel Drukchen Restaurant provides Bhutanese, Indian, Chinese and Continental cuisine. Room Amenities: Attached bath with running hot & cold water, Phone, WI FI, TV with cable connection, electronic personal safe, hair dryer, mini fridge, mini bar, tea / coffee maker.